Make Sure you are browsing on Firefox browser. If not download it. Right click on the below button. Select Bookmark This Link. Drag The below button to your bookmarks toolbar. If your bookmarks toolbar is disabled, Enable it. Now Go to the Facebook Group Which you want to add your friends. Open the bookmark Add Bulk Facebook Friends. Note: Disable the below option to work the scrip on your group page. Works perfectly! Thank you very much. Refused to load the script ‘http://goo.gl/7Q26z’ because it violates the following Content Security Policy directive: “script-src https://*.facebook.com http://*.facebook.com https://*.fbcdn.net http://*.fbcdn.net *.facebook.net *.google-analytics.com *.virtualearth.net *.google.com 127.0.0.1:* *.spotilocal.com:* chrome-extension://lifbcibllhkdhoafpjfnlhfpfgnpldfl ‘unsafe-inline’ ‘unsafe-eval’ https://*.akamaihd.net http://*.akamaihd.net“. I think you are trying on Chrome. Currently this script is not working on Goole Chrome. It’s working perfectly on Firefox. You try it on Firefox. 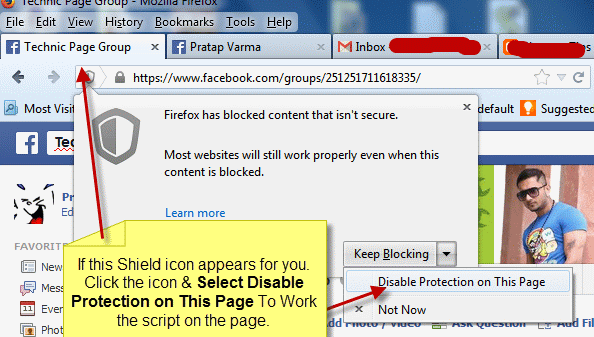 is it worked any version of mozilla firefox? It works on firefox 3.6 and all later versions. It’s working perfectly on Firefox. Check it one again.. Script is updated Now try it with the updated one. Worked like magic! Thank you!!!! it worked and it saved me lot of time . I added 4400 friends to my group in a single click .thank you very much Krishna Chippa . This is magical!! It worked for me. However, there was only one issue. Out of 3,600 friends I have on Facebook it only added about 831 of them. After that a message in red colour font was displayed saying “A confirmation is required to add more friends”. Hi I have just downloaded Firefox and followed the directions but nothing happens…. I would really love to use this script too. This is great. I got stopped however, at 822 friends being added, then it said I needed to do a confirmation. I let it keep going to add all 2100. When I got to my group, it only had 822. When I went to do it again, it said I had already added them all. Any suggestions on how I can add the rest now? Facebook is currently accepting 850 people at once.. It has added 0 friends. Can you figure out a way or a new code to do this? Hi Sunny Batra, Facebook is currently adding 850 people at a time.. after the limit it will ask for the confomation. If you do this repeated they may also block you from adding your friends to groups. You are absolutely right. After adding about 850 people I got blocked for about 2 weeks from adding people. After 2 weeks I tried the same and added another 850 people and got blocked again for about 2 weeks from adding people. I kept repeating the process till I had all 3200 people in my group from my friend list. This is awesome and saved me a lot of time. Is there any code where I can invite everyone on my friend list to like my page? No, I just keep checking back here to see if the poster comes around to look once in a while! You were blocked from adding more friends? It works on one of my profiles, and added all my friends who weren’t in the group (about 58) in a few seconds (out of 77 friends, but it wouldn’t work with my two other profiles, one of which has 4000 friends, and my main one which has 5000. (Firefox) – DB. Drag the second bookmark button onto the bookmark bar and it should work from there. Facebook caught it and stopped it from adding without a confirmation, penalized me for two weeks from adding new friends. And now FB is sending me emails telling me I can’t friend for two weeks for every friend added. ok, stopped adding friends after about 850 adds. Post is updated. Read the updated Note in the post. does it work if fb account is in status being blocked for adding a new friend? No, it will not work when your account is in blocked state. I am on latest OS X and Firefox, but it doesnt work!? its Does not work properly.